I was wondering, by what will be the global temperature be increased, if all known oil & gass resources are turned into CO2 ? Is that mentioned somewhere? Re #71: in order to claim that CO2 is the highest in 600,000 years you have to show that physically a blip like the current one cannot occur naturally (a difficult thing to prove). The ice cores don’t have the sample length resolution to do that since centuries of CO2 levels get averaged into a single reading. Juxtaposing recent ice cores or other actual measurements doesn’t change that fact. That value for Greenland seems pretty low, but I suppose that one could check this against the estimates in the TAR? Warming seas lead to the possible release of methane hydrates trapped in sub-oceanic sediments: methane fireballs tear across the sky, causing further warming. The oceans lose their oxygen and turn stagnant, releasing poisonous hydrogen sulphide gas and destroying the ozone layer. Deserts extend almost to the Arctic. “Hypercanes” (hurricanes of unimaginable ferocity) circumnavigate the globe, causing flash floods which strip the land of soil. Humanity reduced to a few survivors eking out a living in polar refuges. Most of life on Earth has been snuffed out, as temperatures rise higher than for hundreds of millions of years. RE: 96 It is probably even worse than that. I haven’t read the summary yet, but at least before yesterday it was accepted that sulfate aerosols in the troposphere from fossil fuel combustion provided a negative forcing of around 1.5 W/m2. As the aerosol precursor source is gradually removed during the next 50 years due to reductions of sulfur in petroleum and the control of SO2 emissions from power plants, the offsetting effect of these aerosols will be greatly diminished. Thus, not only will we have to deal with the new positive forcing from future emissions of CO2 and other GHGs, and the latent warming from old emissions, we also will have to deal with a more full realization of the forcing from GHGs without the benefit of the obscuring veil of air pollution that everyone agrees should be removed for health and other environmental reasons. The earlier posting that listed the CO2 increases year over year failed to take into account these “hidden charges” that like rising interest on a loan or a balloon payment can not only ruin your day but your species. #92, what worries me more than these recent CO2 increases (and I believe an acceleration over several decades? ), is whether these are caused by human emissions, or whether a growing part of the increase is due to nature responding to the warming & sending its own emissions, or nature’s inability to absorb CO2 as in the past, due to saturation or heat stress and other GW-related conditions. 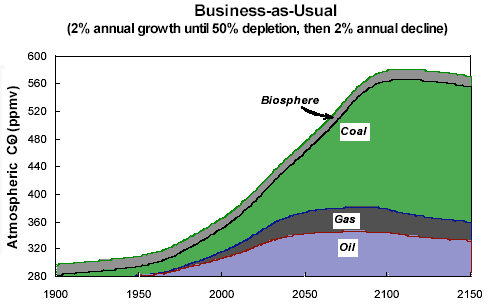 We may reach a point at which, even if human emissions drop to well below the point at which nature previously could reaborb the emissions in a cooler climate, nature takes over and reduces absorption and/or starts emitting net its own GHGs, which causes further warming (also enhanced by reduced albedo), which causes further emissions from nature, which causes further warming, and so on. I call this “runaway warming,” though the scientists here would like to reserve that term for permanent runaway warming, as on Venus. Someone here offered me another term, “hysteresis,” which I think is used for similar mass extinction due to warming events in the past (55 mya & 251 mya). As our moms used to tell us, we shouldn’t play with matches. Solar irradience is not the only issue with respect to the sun, and to dismiss the sun in two lines (p3)is disturbing. And on p9,what anthropogenic activities contributed to early 20th century warming–it wasn’t CO2.Fig SPM-4 shows a temperature trend for N.America that does not correspond to the USHCN data.Table SPM-0 shows a projected sea level rise from melting Antarctica as .14+/-.41 m/century. That error limit (1 sigma? )tells me we have no idea what will happen. Finally, the U.S. DoE (AIE)projects < 5% contribution to kWh consumption in the U.S.by 2030 from sun, wind, biomass etc.Looks like coal will still be king, or with draconian legislation, the U.S. will be a third world country, along with everyone but China. Chip, if you really want to correct global temperature data for short time (annual to multiannual) effects, you should not just account for volcanoes, but also other important effects, mainly El Nino and eventually natural variability on the multiannual to decadal timescale (related to solar cycle or internal). I don’t know which data you used, but for CRU data I get a linear trend of 0.23K per decade for 1990-2006 in the raw data. If you compensate for the El Nino and volcano signal I get a trend of 0.21K per decade for 1990-2006 ( I did not exclude 1992/1993 but interpolate between 1991 and 1994 which might be as appropriate as skipping). In addition you find a roughly 10year oscillation in the “compensated” data set for the last 50 years and also farther back in the instrumental data set. (I doubt if it is of solar origin because it is sometimes in parallel and sometimes opposite to the solar cycle). And this cycle is on its top around 1990 and on its bottom around 2006 (as is the solar cycle). So accounting for natural variability on a timescale relevant for a 15 year trend would result in a higher trend (e.g. starting also at the bottom in 1994 gives 0.25K per decade). Of course, if you calculate the trend farther back to the 60ies and 70ies it will be less because warming has accelerated since then. I have not calculated for GISS and NOAA data, but I think they have even higher trends. If you account for the effect of El Nino on global temperature, 2001 and 2002 are the warmest years on record, and 2006 is the third warmest (only a tiny 0.005K below). Just besides: the cycles 1925 to 1947 to 1976 to 1998 are related to some teleconnetcion indices (mainly representing circulation and pressure patterns in the Pacific region, including El Nino, Pacific Decadal Oscillation, etc). But they have no evident signal in global temperature. This mornings NYTimes has a pretty good frontpage overview of the SPM. The Times was very strategic in this, letting all the momentary journalistic fray occur and the dust settle a bit before delivering its own more fulsome summary of the summary. It has a spread showing several of the graphs, a discussion of the crucial numbers, some decent quotes from scientific personnel, and euphemized humiliations for some of the usual suspects, such as James Inhofe and also our beloved Energy Secretary Sam Bodman, who has been rather busy before the cameras helping the Bush administration take credit for the advances of climate science during the past 5 years. Politics doesn’t just make for strange bedfellows, but also for mutant offspring… We do know how deeply this administration has gestated and nurtured unfettered scientific work, not to say its uncensored distribution. I honestly believe that it would be a much better service for me to keep my personal opinions separate from what I can actually offer the world as a scientist. This is significant, because, as experts, climate researchers are always being urged by others, the media above all, to be founts of knowledge in general and to comment on areas that are well beyond their area of knowledge. When this happens, the results are often embarrassing and, still worse, able to cast suspicion back upon the person, his or her credentials, and even the ultimate value of their scientific work. As an employee of NOAA, Soloman may well be playing it safe here, politically speaking. But the fact is that she’s right. Her real service to society in this matter is her power to create and distribute the knowledge in her domain. She is showing a style of discipline that might be followed elsewhere, difficult as it may be. I was wondering, by what will be the global temperature be increased, if all known oil & gas resources are turned into CO2 ? Is that mentioned somewhere? IANACC: Unfortunately the IPCC couldn’t even try to put forward projections of such scenarios since the science of Peak Oil is still new and the available data on recoverable resources and possible extraction rates are corrupted by the human element. Many of these climate scenarios ironically might turn out to be incorrect, not because of bad science, but simply because instead of cutting emissions voluntarily, we’ll be struck by an economic recession when demand of these resources finally exceeds the rate of supply we are able to produce. No one knows for sure for example how badly the world’s largest oil fields have been geologically damaged by over-production. In fact keeping up with many of the projected CO2 emissions curves by the IPCC scenarios seem unrealistic with the current under-investment in oil and gas industry. The worst outcomes might actually be curbed by the greed and short-term vision of the very industry that is the contributing to the problem. Greenland ice sheets: 0.005 Â± 0.0012 (1961â��2003), 0.021 Â± 0.007(1993-2003). Antarctic ice sheets: 0.014 Â± 0.0041 (1961-2003), 0.021 Â± 0.0035 (1993-2003). Not sure how this propagates to the error of the sums, but it should make them a lot smaller than what you found. Yesterday I had a post which didn’t seem to make it past moderation. All I asked was where will all the rain go? In a warmer world there wil be more evaporation in the oceans, and a warmer atmoshere will hold more moisture. Also the tropical rain belt should expand. Yet in the report most of the world seems to be getting dryer. Can somebody explain this? My apple trees are blooming two weeks early. Seasonal relationships between agriculturally important plants, animals, bugs and birds rare changing. Anyone that does not accept the fact of climate change should go talk to the nearest farmer. Anyone that still does not believe should go talk to the nearest apple tree. As my Mother says,â?? You can not argue with an apple tree.â?? You want proof of global warming? Look at your motherâ? ?s and grandmotherâ? ?s diary on when the apple trees bloomed. Re #90 – There is not known current or intended projects for Methane Clathrates to be used for energy production as far as I understand it at the present time and I will give Humanity some credit for not using it without coming up with a means of sequestering the methane first of all as it would be climate suicide to even consider it otherwise, surely? In this graph (http://europe.theoildrum.com/uploads/465/cv_hansen_fig8.png) James Hansen has Oil and Gas not peaking until around 2030 but that is the best case scenario and 2010 to 2015 is more likely and hence to a degree Climate Scientists and the IPCC are making up extreme case scenarios in order to show us that 550 ppmv is likely with a BAU scenario when it is extremely unlikely that it will ever happen because I doubt that coal can scale to replace Oil and Gas when they both Peak because of what Oil is used for (mainly transport, coal cannot scale to replace that) and having to replace central heating units for electricity in some way (Gas) is not possible. Who is going to replace millions of Gas Central heating systems around the western world and a lot of people use Oil to. Sure Coal and replace Gas for electricty generation to some extent but that is going to be solars, PV, Wind, and Wave/tidal and geothermals job is it not. To start building a lot more coal fired power stations without sequestration will be politically impossible, well unless we are freezing to death that it. Re 106, there is not evidence for this scenario and hence it may be a warry but a distant one. The obcious issue is the breakdown of natural systems ability to absorb CO2 such as the forests and the oceans etc but scenarios that take this into account see it as a gradual (linear) decline and not a sudden (non linear) one. Does anyone know how that is possible if CO2 concentration only increased about 5%? The SPM states that the increase in CO2 leads to a 1.66 W/m2 increase in forcing. I know that doubled CO2 (4 W/m2) has about a 0.8 degree C direct contribution to temperature (along with .7 to 3.7 degrees feedback), so 1.66 W/2 would be about 0.3 degree C, with 0.3 to 1.4 degree additional feedback expected. We’ve seen 0.8 degrees of warming, and expect 0.6 degrees more, which falls within that range. *laughs* Are you telling me that the earth adds to the 0.3 C in some sort of a positive “Feedback” process, to bring it up to your pre-determined number of 0.8 C? God forgive my cursing. Increased heat (wattage per square meter) evaporates more water, which creates more clouds, which increases albedo, if there is a feedback it is a NEGATIVE feedback, not a POSITIVE feedback! Good Lord. Pete, look a little harder: there are clathrate projects being designed now. Look up “pingo” and “Svalbard” for examples. While the geology journals are still debating whether pingos are caused by freezing water or by methane hydrates, the energy journals have funded work to determine that the gas bubbling out is indeed methane. This is like the early oil days, when they had gushers — self-pumping oil, the cheapest possible way to get the fossil fuel: (1) poke a hole in the deposit, (2) fuel rushes out, (3) Profit!! Many thanks for the help on #96, and for today’s renewed demonstration of just what a valuable resource this place is. > sudden (non linear) one. averaged worldwide, maybe, but I’d like to see your source for that. Things like spruce budworm aren’t gradual, and nature works rather suddenly on a species basis sometimes. Losing much of the Northern forests due to warming-insect-fire can happen very quickly. The more ‘work’ the forest has already done exporting wood to market and topsoil to the ocean, the quicker those events happen the next time. So it probably depends on what’s in your own back yard or watershed, whether you see this kind of thing as sudden. Sometimes the perspective from the top of Mauna Loa (“well mixed” average) is too reassuring, I suspect. It is interesting that we still seem to have “skeptics” grasping at straws–questioning ice-core resolution, looking for the tiniest inconsistencies. They seem to have no understanding of the science and the overwhelming evidence for anthropogenic causation–thinking that if they find any tiny issue, the whole problem will go away. The real argument now is over what to do, and the scientific community has been remiss in providing credible guidance here. The science shows Kyoto will barely slow climate change, even if fully implemented. Indeed, if the so-called skeptics truly wanted to argue for doing nothing, they could mount a credible argument that we can’t stop using the IPCC’s own reports. I believe this is the next battle front–which strategy has the greater benefit: do nothing and react to changes as they occur or try to slow warming–and risk slowing the economy–so we have more time to adapt to the inevitable warming that will occur. Anyone still attacking the science is a straggler left behind on the last battlefield. There is in existance a technology which may be able to relace gas (and other fossil fuels) for central heating. The device is called a heat pump. This acts like a refrigerator in reverse and draws heat from the ground and boosts it. It uses electricity to drive it, but requires no fuel itself. In Sweeden most new buildings have them. Wayne, could you make a questimate of the amount of area and volume associated with the chunk of land that’s now about 160 meters above sea level? Pat, its differing from Arctic region to region, 1 or 2 cm a year should be good for the entire North American High Arctic, don’t know about Siberia or European Arctic, suspect it may be less.. But the larger question is what does AGW do to rebound? Given that Glaciers are melting everywhere, and that the sea and ground is slowly warming up… I don’t know, suspect that rebound rate may be very slightly stronger, U. of Washington may have some answers. One conlcusion in the SPM that intrigued me was the projection that major storm tracks would migrate polweward during the 21st century. I have not seen many papers that have addressed this issue and I was surprised that it rose to the level of inclusion in the SPM. Could comment on how robust you think this particular projection is, particularly as it might apply to the mid-Atlantic and northeastern US? And, how widely held do you think this view is in the field of storm tracking? I am surprised that in the SPM none of the historical sea-level rise is attributed to the net transfer of groundwater to the oceans due to overdrafting. I think that there are credible estimates on the order of 200 cubic kilometers per year of cumulative net groundwater depletion in recent decades. The problem with these estimates has been in the lack of good quality long-term data. I would imagine the estimates of net glacier and ice sheet mass losses have their own uncertainties, but they don’t seem to have faced quite the level of skepticism that groundwater depletion has. I don’t think that water storage in impoundments on the other side of the ledger can offset this large transfer (I believe the TAR made this argument). #126 Papers are helpful , but recent reality , much better. A North Atlantic Cyclone brought a thunderstorm with Rain showers in the Arctic, last year in February, with huge temperature differences from the norm from the surface and within the Upper Air. Thundershowers in February over South Central Baffin Island above the Arctic circle (approx. 65 degrees North) , totally unheard of, from a system very much Polewards. At the time I congratulated the GCM model guys who wrote a paper on this before it happened, models sometimes are amazing. Thanks Hank (113) and re: 122. It’s not the question that matters, but the answers. The answer to my question is to show how natural processes cannot produce a spike like the one we are currently seeing. It’s a hard point to prove since there are many possibilities: geological and ocean being the biggest. Looking again my links and Hanks (e.g. http://www.waisdivide.unh.edu/Reference/Download.pm/61/Document.) I see 40,000 years per cm at 144,000 years. Considering that slice thickness is portions of a mm, it’s a huge span of time for each measurement. So stating that CO2 is the highest in 650,000 years based on ice cores is not realistic, there has to be other analysis included because a hundred or couple hundred year blip would be invisible. 1. What is the Special Report on Emission Scenarios and where can I find the examples? 2. What is the significance of this line? Does this have consequences for clean air initiatives? Re #52, #54, et al, on suiting the science to the policy summary: My guess is that you’ve never been involved in putting together a very, very large report before that’s being written by many different people (credited and uncredited) and read by people with wildly different backgrounds. I’m currently working as co-author on a report on the oil industry for the AGs of five northeastern states. Our process involves research, drafting, and comments from our consulting firm, academics, and staff in the AG’s office. We’ve spent months researching, writing, re-writing, correcting, etc., the body of the report, which will be a few hundred pages. We know that for whoever reads any of this report, the vast majority will only read the executive summary. So now that we are in the final stages, we’ve had extensive discussions about the exec. summary, to make sure we got the language describing our conclusions exactly right. Having done that, we are now going back through the body of the report and correcting the text to match the summary. Your mistake is in thinking that because we are changing the body of the report, we are altering the research to suit the summary for policy makers, or some other non-scientific purpose. The summary is the extension of the report. It’s when everyone sits down and thinks very carefully about what the report does and does not say. It is wholly based on the research in the body of the report. When we’ve finally fixed (as in “set in stone”, not “corrected”) the language in the summary, then we change the body of the text–not because the research in the body was wrong, but because the body (due to sheer size) was not vetted as carefully as the summary. The language that gets changed in the body is not changing the science; it’s changing the descriptions of the science in a draft that has been edited, re-edited, re-edited, and re-edited to make sure the conclusions in the text are every bit as precise as the carefully considered summary. Re. #83: I really wish the Dept. of Energy hadn’t published that $29B figure, when so much of it seems to consist of tax credits and re-labeled energy technology investments. Since the 1990’s NASA spending on Earth Science research and technology, including satellite construction and operations, has declined by about 25% when adjusted for inflation. (See the pre-publication draft of the latest Decadal Survey from the National Academy of Sciences, http://www.nap.edu/catalog/11820.html). Disclaimers: I do have a vested interest in this, in the sense that NASA budgets affect whether projects I think are important can go forward. That said, even with the declining budgets I still have plenty of interesting work to do and have little personal financial interest in which projects get selected or dropped. Opinions/comments here are my own and in no way represent official NASA policy, etc. Back to science and the 4th assessment: I was struck by some references to carbon cycle feedbacks. Different subfields of ecology have different definitions of “plant functional type” emphasizing different features of morphology, life history, competitive ability for different resources, and so on. No wonder the leading ecological models that could simulate multi-annual to multi-decadal feedbacks use different numbers and lists of plant functional types and parameterize their responses differently. Plus that humans tend to have this fondness for promoting some functional types, such as large-seeded palatable grasses and flowering shrubs, and removing others, such as large slow-growing trees with strong wood. I wonder about the assessment’s conclusion that precipitation decreases are likely in subtropical regions (p. 12). That seems more like a statement informed by opinion, perhaps implicit in the models, about which feedbacks and scales will dominate (synoptic circulation changes, mesoscale precipitation feedbacks, changes in leaf-level water use efficiency, plant population dynamics, changes in human land-use patterns, ???). There’s a lot of work to do here on understanding which of various measured or experimentally demonstrated effects are most likely to be important at the relevant time scales, especially when changing information content gets factored in. Funds to do that work are becoming more scarce. Also we badly need global observations of on-going changes in ecosystem composition. To be (un)fair with respect to satellite observations of ecosystems, there have been a lot of smart people trying to teach pigs to sing. The existing global data sets barely go beyond saying: green/not green. For example, for woodlands with average tree covers estimated at 40 to 60% a state-of-the-art “global continuous fields” estimate of tree cover has an uncertainty almost as large as the estimated values. While algorithms using satellite data have advanced, the information content of satellite images made with a few broad spectral bands is no greater than when those few bands were selected 2 decades ago. That’s where we’ll be until some government collects or buys much more information-rich satellite data, globally, and makes those data widely available. 1. All previous natural (non-manmade) warmings or coolings took place veeeeeeeeeeryyyyy slowly, over thousands or millions of years not within a couple decades like this. 2. That the ice cores show that it is 650,000 years since Co2 has been this high. 3. That there are also natural causes to raise Co2, and they caused warming too, but because it was over thousands of years, it caused only gradual extinctions. And they could cause non manmade warming also in the future, over thousands of years, with gradual extinctions resulting. But the speed of the current manmade Co2 rise is unprecedented. The fact that there have been gradual warmings/coolings natually in prehistory is not an argument for allowing a rapid Co2 rise now. 4. That IPPC scientists wanted it to say 99% as all agree AGW is happening, and that it was their government minders in the US that wanted it pulled back to 90%. A battle between scientists and governments. 5. Bring up the Waxman hearing in this context: the Bush administration censoring of government scientists to downplay global warming. This is my Laymans guide to the IPPC Report! Considering the general acceptance of the urgency of dealing with man made global warming, will the next IPCC reports then be prepared more frequently ? Five years is a long time, when we are talking about a point of no return within possibly 10 years time ! Are these guys like Bodman political appointees? If we science-sympathetic laymen in the evidence-based community can get a science sympathetic president elected, can we get rid of all the deadwood preventing action? Or do bureaucrats remain festering long after the administration that selected them is gone? re yr ….our beloved Energy Secretary Sam Bodman, who has been rather busy before the cameras helping the Bush administration take credit for the advances of climate science during the past 5 years…. I diary at dailykos on global warming from an activist- laymans POV: how to elect AGW problem-solvers,and remove the obstacles. I worry about our chances of reversing action without a clean sweep. Re #92: Llewelly, I think those 2006 CO2 numbers aren’t complete. See this article. Is lifetime of CO2 the same as or related to residence time? According to this: http://www.royalsoc.ac.uk/displaypagedoc.asp?id=13539 the residence time is about 3 years. Maybe a better way to look at it is the impulse response function, a simple one is here: http://unfccc.int/resource/brazil/carbon.html The chart shows the carbon dropping to about 1/3 within 100 years. A naturally occuring impulse might be impossible, but would not show up in the ice core samples. You may be right that it is easier to write a large report the way you say, but if the objective is to get skeptics to believe it, being transparent about how the summary is supported by the science is essential. Susan, before saying what I think of your Report, I’d like to tell you that I have a science background in hydrologic modeling. Many scientists have background in meteorology or atmospheric science but little or no background in hydrology. Climate is more than atmosphere and weather of course. Hydrology of snow and ice is a big part of what climate science should be. My specific background (30 years) was in hydrologic modeling and flood prediction with NOAA’s National Weather Service. I focused on snowmelt and ice hydrology. My background included observations of hydrologic climate change in the Upper Midwest, western Great Lakes and northern Great Plains. My study and research on climate change and hydrologic change was done mainly on my personal time. I was not allowed to talk about climate and hydrologic climate change while at work for NWS North Central River Forecast Center in Chanhassen, MN. I agree with all but one of your points. The one I disagree with pertains to extinctions. Based on what I’ve studied, there were two extinctions involving or caused by global warming which were probably not gradual. The extinctions at around the end of the Permian (about 240 or 250 million years ago) and the marine extinctions which occurred at the Paleocene Eocene boundary (55 million years ago). I could give you references on those if needed. Sure it is. It won’t happen today, but it will happen soon if we make a concerted national effort. Compare the mass of the cryosphere to the mass of the Earth. Then compare the mass of the Earth to the mass of the Sun. Do the math. If you want the equations, post here again and let me know. The answer is: not very likely. The burden of proof is on the affirmative. Show us evidence that such an event happened, and we’ll take it into consideration. In the meantime, saying “we don’t have the evidence, therefore it could be there” reminds me of UFO fans. Pat Neumann. If you agree that the warming occurred extremely slowly, how is that consistent with the rapid extinctions. I am not saying it is not consistent, I just want to understand how these two phenomena jive. Susan. Assuming your summary was essentially correct, thank you. Ultimately, the audience that really matters is the layman public and the politicians. Unfortunately, I am not sure most people really care about extinctions and assume they can handle a change in temperature of several degrees. Just turn up the air conditioning. In fact, a few years ago, that was one of Bush’s responses to global warming. Just get more air conditioning. So far, the impact of this new report on the Bush administration is approximately zero. Obviously, all this warming is not considered a big deal when potential job losses are considered more important. This is kind of the reverse precautionary principle. If there is the slightest chance that any policy will impact jobs and GDP, then we must err on the side of destroying most of the planet. First, I can envision dozens of investments that will support jobs and improve the economic well being of those making the investments. When we have exhausted all those investments which have lowered our costs to heat and electrify our homes and run our automobiles and run our industries and companies, then we can talk about tradeoffs between lower energy use and GDP. Re 144, with all due respect, lack of evidence does not prove lack of existence! I don’t think it’s simple to show with any degree of certainty a physical proof in either direction. I was objecting to using the ice cores as proof as the report seems to imply. there any studies about the possibility of a orbital shift for the planet with the change in mass from ice to water? The effect of the re-distribution of earth’s mass on its orbital changes, is exceedingly tiny. But it’s not zero. Since earth is not a perfect sphere, its gravitational field is not perfectly “spherically symmetrical.” The accumulation/wasting of ice sheets alters the mass distribution, and therefore alters the “dynamical form factor” which describes the 1st-order deviation from perfect spherical symmetry. The effect appears to be important when computing earth’s orbit on timescales of 40 million years or so. In fact, it’s one of the sources of uncertainty in computing orbital parameters in the very-long-distant past (which is important for relating past climate to earth’s orbital variations), but it is taken into account in the most precise, and longest timescale, calculations. I am confused by some terminology in the SPM which is “non-standard” as far as statistics goes. The SPM uses the terminology “high confidence” to mean “an 8 out of 10 chance of being correct” whereas statistics (as a field of study) uses the phrase “highly significant” for a 99% confidence level. The SPM uses the term “very high confidence” to refer to a 9 in 10 chance of being correct whereas statistics uses the phrase “very highly significant” to refer to the 99.9% confidence level. Other figures are given using a “likely” or “very likely” valuation to mean 66% and 90% probability respectively but there is a footnote indicating some of these figures are based on “expert judgement”. What does that mean and how do we interpret a probability and a confidence interval based on “expert judgement” rather than statistical calculation? Perhaps this will be clarified in 3 months in the first of the actual science report? Is it fair to say that all of the fossil fuel reserves will be burnt eventually, and that it’s merely a question of how slowly or quickly we burn them? Seems to me this is a fairly important factor, especially from the point of view of adaptation strategies. Also, there doesn’t seem to be much account taken of the benefits of emitting activities. Hundreds of millions of people have been dragged out of poverty in India and China in the last 30 years, largely thanks to activities that generate major emissions. What is the economic cost-benefit equation for climate change? I would like to see an attempt at estimating the net cost or net benefit of the expolitation of the remainder of fossil fuel reserves at various rates. Where there is a net cost, this would give us an idea of how much we should efficiently spend on emission reduction etc. Put another way, it would tell us the economically most efficient rate at which to burn the remaining fuel. If the cost of exploiting fossil fuel reserves more slowly is lower than the climate change adaptation costs that are avoided by doing so (among other things), then it’s rational to slow down fossil fuel consumption. Furthermore, I imagine once all the fuel is burnt we will be faced with an emerging global cooling scenario?